Robert Groslot is an accomplished composer, conductor and pianist acquainted with many genres and styles. As a composer he is best known for his mastery of orchestral texture as well as his distinctive colored and rhytmical challenging writing. His work catalogue includes many major orchestral pieces as well as solo and chamber music works. Important works are Rainfall on Pink City, Black Venus, The Great Globe (all three commissions), Si le Monde... and a series of sixteen concertos for solo instruments and orchestra. In addition to works for the traditional concerto instruments - piano, violin and cello, Robert Groslot didn’t hesitate to write concertos for saxophone, harp, piccolo, flute, oboe, marimba, euphonium, guitar, english horn, trumpet, organ and double bass. These concertos are one by one very challenging and inspirational pieces for the performer, and are written in a personal and accessible style. As a guest-conductor he worked with the Rotterdam Philharmonic Orchestra, the London Symphony Orchestra, the Ulster National Orchestra, the National Orchestra of Belgium, the Royal Philharmonic Orchestra of Flanders, the Arnhem Philharmonic Orchestra, the North Netherlands Symphony Orchestra and many others. He is the founder and conductor of the orchestra II Novecento which he conducts in concerts throughout Europe, such as the “Night of the Proms”. He collaborated with top soloists both from the classical scene and the pop scene and has performed for more than 10.000.000 visitors in total. Soloists include Daniel Blumenthal, Wayne Marshall, José Van Dam, Ole Edvard Antonsen, France Springuel, Sandra Schwarzhaupt, Jan Michiels, Manuel Barrueco, Steven Mead and others, as well as well-known pop artists such as Joe Cocker, James Brown, Sting, Toto, Andrea Bocelli, Zucchero and many more. Robert Groslot has begun his career as a pianist. After winning the Alessandro Casagrande Competition (Terni, 1974) and becoming laureate at the Queen Elisabeth Competition (Brussels, 1978), he was regulary invited as a soloist and chamber musician. Robert Groslot undertook concert trips in more than 20 countries in 4 continents and played over 60 different piano concertos, some of them creations. He also made many studio, radio and television recordings, as well as about 100 CD’s. 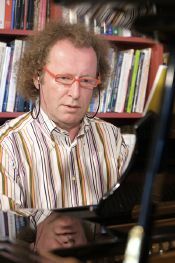 He worked as Professor of piano at several institutions: the Lemmens Institute, where he also founded and led the ensemble for contemporary music, the Utrecht Conservatory and almost his entire career also at the Royal Conservatory of Antwerp. The he was also appointed Artistic Director between 1995 and 2002, and during this period has put heavy emphasis on orchestral playing for all students, inspired by the successes of two national youth orchestras he grounded and led in the ‘90s.